GOP Anti-Trump Insiders and Pundits – It’s Time to SHUT UP! by Tom Balek, Contributing Author: Every day, day after day, the anti-Trump insider Republicans wail and moan, louder and longer. It’s beginning to sound like a teenage summer chainsaw movie. Or a difficult childbirth. After his failure floating the hopeless idea of a third-party candidate, Weekly Standard editor and #NeverTrump czar Bill Kristol now suggests that the likelihood of Trump’s impeachment is so great that the GOP insiders should be allowed to choose his running mate. So-called “conservative” radio pundits like Steve Deace, Michael Medved and Glenn Beck are literally gurgling blood, such is their terror of a Trump presidency. I have one question for all of you righteously indignant media opportunists who are doing everything humanly possible to damage Trump’s candidacy. What do you want? Do you want Hillary to be elected? You say you don’t. You claim to know how calamitous another four or eight years of Democrat rule will be. You don’t deny the deadly impact that decades of Clinton appointees to the courts will bring. You know how corrupt the Clintons are, and have been, and can’t doubt that it would get worse – much worse. You admit Clinton has no clue about the economy and her foreign policy has been a disaster. There will not be a third-party candidate.1 There will not be an insurrection at the Republican convention that will yield a new nominee. Donald Trump will face Hillary Clinton in the election, and that is settled. It’s not good enough to say you just aren’t going to vote, because failure to vote for one is a vote for the other, and that is mathematical, metaphysical fact. If you have any hope of being taken seriously, or maintaining your relevance in the media and in public life ever again, you have only one choice of action. 1 Editor's Note: There is one third-party candidate on every state ballot. Gary Earl Johnson is the Libertarian Party's nominee for President of the United States in the 2016 election. He served from 1995 to 2000 as Governor of New Mexico. Supports legal regulated prostitution, gay unions, government out of marriage business, marijuana is safer than alcohol; legalize marijuana, and does not support border wall or sending back illegals. Tags: Tom Balek, Rockin' On The Right Side, GOP Anti-Trump Insiders and Pundits, Time to SHUT UP To share or post to your site, click on "Post Link". Please mention / link to the ARRA News Service. and "Like" Facebook Page - Thanks! by Newt Gingrich: It has been more than half a century since President Lyndon Johnson announced the War on Poverty, a vast expansion of the welfare state aimed at lifting up America’s poor. 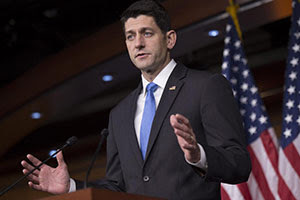 Tags: Newt Gingrich, commentary, Speaker Ryan, Better Way to Fight Poverty, poverty, To share or post to your site, click on "Post Link". Please mention / link to the ARRA News Service. and "Like" Facebook Page - Thanks! Donald Trump has internalized the maxim Benjamin Jowett gave to his students at Balliol who would soon be running the empire. Assume, as we must, that Trump believes what he said. Why, then, should he apologize for speaking the truth, as he sees it? To do so would be to submit to extortion, to recant, to confess to a sin he does not believe he committed. It would be to capitulate to pressure, to tell a lie to stop the beating, to grovel before the Inquisition of Political Correctness. Trump is cheered today because he defies the commands of political correctness, and, to the astonishment of enemies and admirers alike, he gets away with it. To the establishment, Trump is thus a far greater menace than Bernie Sanders, who simply wants to push his soak-the-rich party a little further in the direction of Robin Hood and his Merry Men. But Trump, with his defiant refusal to apologize for remarks about “rapists” among illegal immigrants from Mexico, and banning Muslims, is doing something far more significant. Trump’s rebellion is not only against the Republican elite but against the establishment’s claim to define what is right and wrong, true and false, acceptable and unacceptable, in this republic. Contrast Trump with Paul Ryan, who has buckled pathetically. But Ryan’s remark raises fewer questions about Trump’s beliefs than it does about the depth of Ryan’s mind. We have seen a former president of Mexico curse Trump. We have heard Mexican-American journalists and politicians savage him. We have watched Hispanic rioters burn the American flag and flaunt the Mexican flag outside Trump rallies. We are told Trump “provoked” these folks, to such a degree they are not entirely to blame for their actions. Yet the simple suggestion that a Mexican-American judge might also be affected is “the textbook definition of a racist comment”? The most depressing aspect of this episode is to witness the Republican Party in full panic, trashing Trump to mollify the media who detest them. After he had locked up his nomination, Barry Goldwater rose on the floor of the Senate in June of 1964 and voted “No” on the Civil Rights Act. The senator believed that the federal government was usurping the power of the states. He could not countenance this, no matter how noble the cause. Say what you will about him, Barry Goldwater would never be found among this cut-and-run crowd that is deserting Trump to appease an angry elite. These Republicans seem to believe that, if or when Trump goes down, this whole unfortunate affair will be over, and they can go back to business as usual. Sorry, but there is no going back. The nationalist resistance to the invasion across our Southern border and the will to preserve the unique character of America are surging, and they have their counterparts all across Europe. People sense that the fate and future of the West are in the balance. While Trump defies political correctness here, in Europe one can scarcely keep track of the anti-EU and anti-immigrant nationalist and separatist parties sprouting up from the Atlantic to the Urals. Call it identity politics, call it tribalism, call it ethnonationalism; it and Islamism are the two most powerful forces on earth. A decade ago, if one spoke other than derisively of parties like the National Front in France, the blacklisters would come around. Now, the establishments in the West are on the defensive — when they are not openly on the run. The day of the Bilderberger is over. Back to Jowett. When the British were serenely confident in the superiority of their tribe, faith, culture and civilization, they went out and conquered and ruled and remade the world, and for the better. When they embraced the guilt-besotted liberalism that James Burnham called the “ideology of Western suicide,” it all came down. The empire collapsed, the establishment burbled its endless apologies for how wicked it had been, and the great colonial powers of Europe threw open their borders to the peoples they had colonized, who are now coming to occupy and remake the mother countries. But suddenly, to the shock of an establishment reconciled to its fate, populist resistance, call it Trumpism, seems everywhere to be rising. Tags: Patrick Buchanan, conservative, commentary, Why Trump, Must Not Apologize To share or post to your site, click on "Post Link". Please mention / link to the ARRA News Service. and "Like" Facebook Page - Thanks! by Kerby Anderson, Contributing Author: For more than 200 years, candidates have been running for election in districts that were gerrymandered. The term comes from the name of the governor in Massachusetts. In 1812, Governor Gerry signed a bill that changed the district lines for candidates. One of those contorted districts in the Boston area resembled the shape of a salamander. Thus the term “gerrymander’ was born. Recently I learned that gerrymandering goes all the way back to the first congressional elections and involved two of the founders. One of them was James Madison, architect of the Constitution. The other was James Monroe. Both went on to become the fourth and fifth presidents of the United States. In the summer of 1788, Virginia became the 11th state to ratify the Constitution. Governor Patrick Henry called for elections, and worked to prevent James Madison from serving in the Senate or the House of Representatives. First, he worked with members of the Virginia legislature to deny Madison a Senate seat. Back in those days, the legislature selected the U.S. Senators. Next he worked to deny Madison a seat in the House of Representatives. Patrick Henry convinced the Virginia Legislature to draw the Fifth District lines so they included both Madison’s home and Monroe’s home. The two friends were forced to compete against each other. During the election they traveled together and debated each other at various gatherings. Through hard and smart campaigning, Madison managed to defeat Monroe and then served in Congress. There is a bright side to all of this. During the debates with Monroe, Madison realized how important a Bill of Rights would be. Some of the voters wanted such protections. So he made a campaign promise that he would support a Bill of Rights when elected to Congress. This is one campaign promise that was kept. Within six months, Madison pushed through the Bill of Rights, which were later ratified. I suppose you can say that good things sometimes do come from districts that have been gerrymandered. 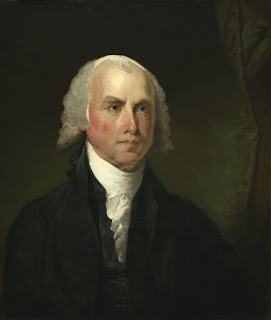 Tags: Kerby Anderson, Viewpoints, Point of View, Gerrymandering, the Founders, James Madison, James Monroe To share or post to your site, click on "Post Link". Please mention / link to the ARRA News Service. and "Like" Facebook Page - Thanks! Art of the Crooked Deal . . .
. . . Many feel that the Hillary Uranium deal with Russia put her in the same category as Benedict Arnold, the American revolutionary war traitor. 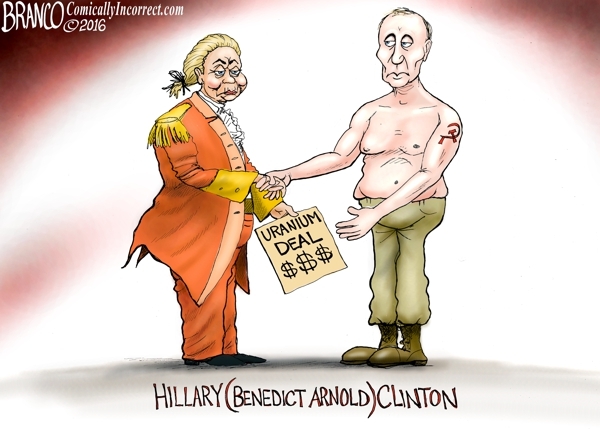 Tags: Editorial Cartoon, AF Branco, United States Uranium, Uranium deal with Russia, Hillary Clinton, Benedict Arnold, traitor To share or post to your site, click on "Post Link". Please mention / link to the ARRA News Service. and "Like" Facebook Page - Thanks! 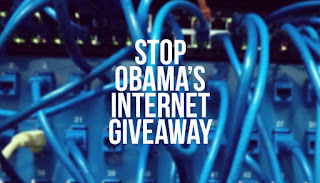 Is The Obama Internet Giveaway A Criminal Conspiracy? by Robert Romano: The National Telecommunications and Information Administration (NTIA) on June 9 announced a plan preparing to transition the Internet Assigned Numbers Authority (IANA) functions to the Internet Corporation for Assigned Names and Numbers (ICANN) on September 30. Transitioning the IANA functions while the defund is in effect would be a violation of the Antideficiency Act at 31 U.S.C. 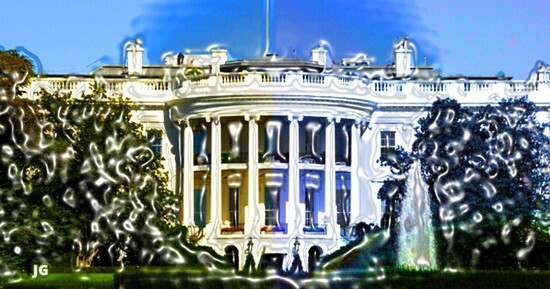 § 1341(a)(1)(A), which prohibits any federal agency from “mak[ing] or authoriz[ing] an expenditure or obligation exceeding an amount available.” Agency officials violate the Antideficiency Act when they expend appropriated funds in violation of prohibitions in an appropriations act, since the agency’s appropriations were not available for those prohibited purposes. Federal officials who “knowingly and willfully” violate this prohibition, which is a felony, are subject to a fine of not more than $5,000 and a maximum jail term of two years. By preparing a plan for relinquishing responsibility over the IANA functions, NTIA agency officials are apparently planning to violate the congressional defund and the Antideficiency Act. That is illegal under 18 U.S.C. § 371, which makes it a crime to “conspire either to commit any offense against the United States… [and] do any act to effect the object of the conspiracy.” Since transitioning the IANA functions is illegal, planning and preparing for the transition also clearly does. Therefore, the agency is “knowingly and willfully” preparing a plan that if effected today, would violate the congressional defund, and constitute a criminal conspiracy. But it gets worse. Since the final outcome of the transition will be that ICANN will be the world’s sole resolver of Internet domain names and numerical IP addresses, it would result in a situation inconsistent with antitrust law. ICANN receives exclusive fees of $0.18 for every domain name sold in the world, raking in tens of millions of dollars every year. Currently, the domain name system of overseen by a U.S. government contract, but post-transition, it will be completely up to ICANN to set these fees. So, what the heck is NTIA doing? It is knowingly, based on its past statements, not only planning to transfer a governmental function to a singular corporation in violation of the law, but also to create a global monopoly over the world’s Internet domain name system, which carries an even greater penalty. 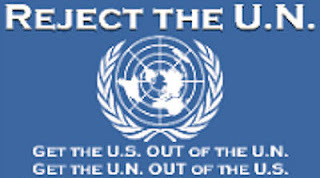 As the author of the defund, Rep. Sean Duffy (R-Wis.), noted in a letter in January to ICANN, “The Commerce Department has no money to consider your proposal and I will continue to do everything in my power to ensure that it never does.” Now, if anyone could speak to the intent of the legislation, it would be Duffy, who wrote it. This is significant because NTIA administrator Lawrence Strickling has claimed he consulted with Congressional staff on the rider’s intent, but clearly, he never consulted with the only one who mattered and that was Duffy. Nobody ever asked that office. Who did they consult with? Opponents of the defund? In Singapore on Feb. 15, 2015, Assistant Secretary for Communications and Information at the Department of Commerce Lawrence Strickling answered a question about why he believed he was allowed to attend at taxpayer expense and still work on the Internet giveaway, saying the defund doesn’t defund that much. In fact, the only reporting in the omnibus spending bill for fiscal year 2015 Congress directed “NTIA to inform appropriate Congressional committees not less than 45 days in advance of any such proposed successor contract or any other decision related to changing NTIA’s role with respect to ICANN or IANA activities.” That’s it. Report if there are any changes to the current contract. Not, travel all over the world and create a plan for relinquishing the Internet Assigned Numbers Authority (IANA) functions. Ironically, when NTIA unilaterally modified the IANA functions contract in 2015, it never bothered to notify Congress 45 days ahead of time. Besides this vague assurance, NTIA never produced its contingency plan should the IANA functions transition harm U.S. interests in its subsequent quarterly reports to Congress here, here, here, here and here. So, while on one hand, Strickling seems to want to follow reporting requirements that Congress never enacted, and then cite those reporting requirements as somehow empowering him to work on the IANA functions transition that is prohibited by law, on the other hand, his agency has failed to follow the actual reporting requirements that Congress did enact. This is sloppy work to say the least. Which says, again, that none of the funds may be used to relinquish responsibility for the IANA functions, and which the author of the bill stated does not even allow NTIA consider transitioning the functions. 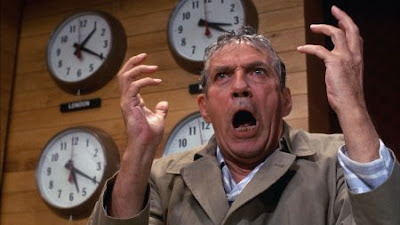 Members of Congress were not impressed with the NTIA announcement either. And U.S. Sens. 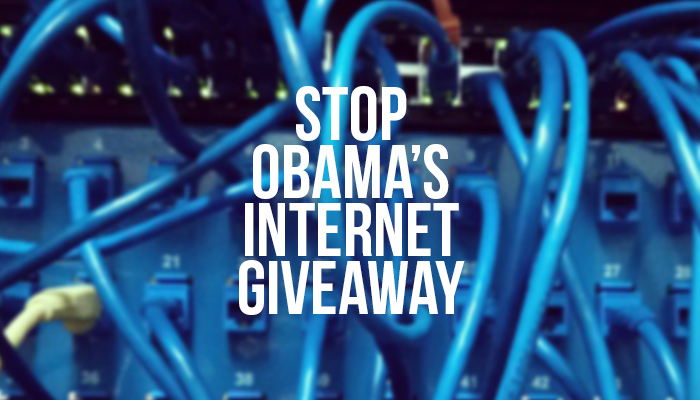 Ted Cruz (R-Texas), James Lankford (R-Okla.), Mike Lee (R-Utah), and Rep. Sean Duffy (R-Wis.) issued an equally condemning statement with the ominous headline, "Obama administration preparations to give away the Internet violate federal law." The only question is if anybody in Congress or law enforcement will truly do anything about it. Maybe we’ll find out if the laws Congress writes are worth the paper they’re printed on or not. Tags: Robert Romano, Americans For Limited Government, Obama Internet Giveaway, Criminal Conspiracy? To share or post to your site, click on "Post Link". Please mention / link to the ARRA News Service. and "Like" Facebook Page - Thanks! by Paul Jacob, Contributing Author: We are living in what I hope are the latter days of the Watergate Era. I’m old enough to remember Watergate. The un-making of President Nixon, before our very eyes, informed Americans in a deep and profound way. It led, in part, to the election of Jimmy Carter, often referred to as one of the least effectual presidents. And the Carter presidency led to Ronald Reagan. While living under Watergate’s dark shadow, not all of us took away the same lesson. We outsiders learned, once again, that power corrupts. Insiders, on the other hand, learned something different: never willingly play a part in your side’s unmasking and un-making. We tend to forget, what with the economic rebound and end of the Cold War, that the Reagan Administration had significant scandals. At the time, Reagan was dubbed the “Teflon President,” because Reagan & Co. figured out how to react: shrug; stall; deny, deny, deny. For this reason, scandal flowed off him, not sticking, as water off a well-oiled duck’s back. Reagan and the Republicans did not allow what Republicans had allowed in Nixon’s day: there was no turning on one’s own, no (or few) breaking of ranks. Then, President Bill Clinton took the effrontery of denial and stonewalling to new heights. With great help from fellow Democrats. And so it goes, even to the present day, with Hillary Clinton carrying on her husband’s tradition. She, the first candidate to run for the presidency while under official investigation by the FBI, just received the current president’s endorsement. The back-room deal has been made, perhaps? Obama will not allow Hillary to be prosecuted. It would tarnish his legacy. Tags: Paul Jacob, Common Sense This Too Shall Pass To share or post to your site, click on "Post Link". Please mention / link to the ARRA News Service. and "Like" Facebook Page - Thanks! will be around 475,000 due to budget cuts. 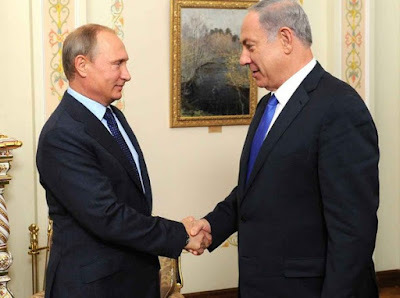 by Justin Johnson & Adam Lemon: Today, the United States and its allies face a wider and more serious array of threats than at any point since the end of the Cold War a quarter of a century ago. While the demand for troops to confront these challenges is increasing, the size and readiness of the U.S. Army is in steep decline. Years of budget cuts have rapidly shrunk the Army to a size unseen since before World War II. The preparedness of the troops has been damaged as well. The Army has been forced to cut training and next-generation weapons programs that are vital for preparing the force for 21st century conflict. Gen. Daniel B Allyn, the vice chief of staff of the Army, has witnessed firsthand the damage done by the defense budget cuts. Allyn will discuss the state of the U.S. Army at The Heritage Foundation on Monday, June 13. Before rising to the No. 2 position in the Army, Allyn served in a number of combat commands and is uniquely positioned to discuss the serious challenges facing the U.S. Army. 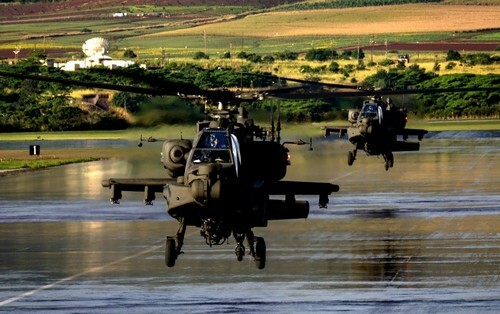 In 2011, the Army had more than 566,000 active duty personnel. By the end of this summer, that number will be around 475,000 due to budget cuts. That smaller force will be called upon to do far more tasks than it did in 2011. Among these will be training and reassuring allies, destroying the Islamic State, and deterring Russia, China, and Iran. This is all in addition to maintaining a lasting presence in Afghanistan. The decline in numbers will continue through 2018, when the Army is expected to bottom out at 450,000 troops. This decline is even more troubling when considering the number of brigade combat teams, the building block of deployable Army forces. The Army totaled 45 brigade combat teams of active duty personnel in 2013. By the end of 2018, there will be only 30. While the brigade combat teams have been reorganized to increase combat power, a 20 percent decline in troops is causing a 33 percent decline in brigade combat teams, thus the Army will have fewer units to rotate through an increasing number of operational tasks. Since budget cuts began, the Army’s readiness to deploy and fight effectively in the event of conflict has suffered dramatically. The Pentagon has tried to remedy this by decreasing or cutting funding to several Army weapons modernization programs in order to better fund readiness and training. Yet with all this effort, according to Pentagon officials only one-third of active and reserve Army brigade combat teams are sufficiently ready for combat. Of the roughly 20 active and reserve teams that are ready for combat, 11 are already assigned to combatant commands, leaving only nine brigade combat teams for unforeseen contingencies. In addition to poor readiness in general, the Army has focused so much on dealing with insurgencies in Iraq and Afghanistan that it is ill-prepared for conflict with conventional threats like the rapidly expanding and modernizing militaries of Russia and China. As Congress debates the 2017 defense authorization bill, it must recognize that the Army is smaller, faces greater threats in more varying regions of the world, and is ill-prepared to fight a modern war. Our military commanders have been raising the alarm, but Congress is yet to act decisively. Join The Heritage Foundation on Monday, June 13, for an important discussion about the future of the Army. Justin T. Johnson (@jus10j) specializes in defense budgets and policies for The Heritage Foundation’s Allison Center for National Security and Foreign Policy. Adam Lemon is a member of the Young Leaders Program at The Heritage Foundation. Tags: U.S. Army, shrinks, threat proliferate, Gen. Daniel B Allyn, Vice Chief of Staff of the Army, Justin Johnson, Adam Lemon, Heritage Foundation, The Daily Signal To share or post to your site, click on "Post Link". Please mention / link to the ARRA News Service. and "Like" Facebook Page - Thanks!